The funny part is, there really is no “typical” day. There have been days we did a field trip in the morning and worked in books all afternoon. There have been days that we did absolutely nothing but TV and Minecraft (oh the Minecraft…). It really does change every day. But! I will try to give you the best snapshot I can. Somewhere around 6:30, my youngest — who is 23 months — wanders into my room. My door is always open and he can open his, so he just walks in when he’s up. Sometimes he snuggles with me and nurses, and sometimes he goes straight for my husband and “talks” to him and plays while he gets ready for work. They go downstairs and get something to eat, and usually, the other kids get up between 7:15 and 8 and head downstairs for breakfast. My husband leaves for work at some point in here and I get to sleep a little longer! This started when my oldest turned 6 — I finally felt comfortable letting them be awake for a little while before I got up. It’s been nice. But, they can and do come up and wake me if they need anything. Sometime between 8:30 and 9:30 I’m up. (And I can hear them prior to that because sound in our house carries easily. And often they do come in.) Typically they get something else to eat — I might make a smoothie or slice them an apple and toast — and I check in on my online business. Email, Facebook, etc. I don’t always do this first thing in the morning, but if I have a major project going on I definitely do. The kids wander in and out and often play in their rooms while I do this, building Lego creations, messing with their tools, making tents, etc. Three of the kids in an old carriage at a local children’s museum — a recent homeschool group field trip. Once a week, we have a meeting with our homeschool group, and on those days we’re downstairs by 8 and out the door around 9. Group meets from 10 – 12(ish). Three weeks out of the month we have a field trip to somewhere — a museum, a factory tour, a working music shop, etc. One week out of the month we meet at a church and have an actual “school” experience. It’s sort of like a good play-based preschool. We have “centers” for the kids (books, puzzles, sandboxes, water play, etc.) and a few hands-on activities and art projects. We finish up with snack and social time, and are usually home between 1 and 2. Sometime mid-morning, we head into the kitchen for our morning chores. This includes emptying the dishwasher, cleaning up snack/breakfast dishes, sweeping the floor, tossing in a load of laundry, feeding the sourdough starter, etc. I’ll also pull out meat for the night’s dinner or start something (like cooking a whole chicken in a pot for soup). I might also start lunch at this time, if I’m not doing something super simple. We often have leftovers, veggies and guac/hummus, smoothies, cheese and crackers, and other easy stuff for lunch. 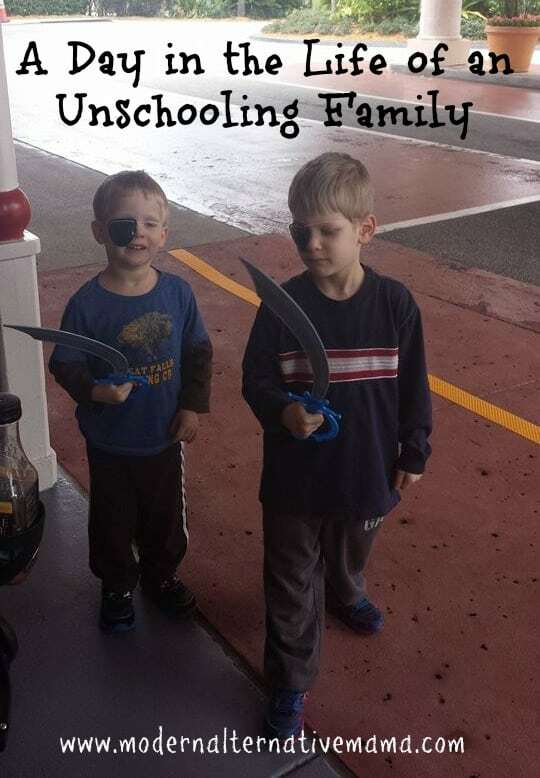 The boys are pirates, on our recent vacation. We learn on the road, too! Once the chores are done, and any mess the kids have made in their rooms or the living room is picked up, then they are allowed to have some “fun” time. My middle boys (3.5 and 5.5) usually choose Minecraft. My daughter is currently enjoying Lindsey Stirling videos on Youtube (she’s a professional violinist who plays upbeat/modern music while dancing) and she dances along. There are often art projects at this time, as my daughter also loves arts and crafts — boxes get turned into robots, puppet stages, and more. Sometimes there is Lego building, or the trains come out. Daniel, 5.5, is trying to build a robotic car…and Nathan, 23 months, is tackling him. Play continues until my youngest crawls into my lap and nurses to sleep (or curls up on the couch and falls asleep!). He will nap for 30 min. to 2 hours. While my youngest is napping, I will typically have the older kids take a break and clean up the projects they’ve already worked on, and I will do some cleaning too. Then, on some days we will sit and pull out their math books, their reading books, and take turns reading together, etc. This is only if they want to. Sometimes they are very excited about it and we will do it for hours; sometimes they are not and we don’t. If we don’t do any math or reading then they may watch movies like “Magic School Bus” or “How It’s Made” or they may continue some project from the morning, or come up with something new. We have puzzles, pattern blocks, matchbox cars, and a number of different toys that they can choose from. The boys also have Nerf guns and targets and they sometimes come up with games with these. It’s snack time! He has cheese sticks. Once the little one is up, then we usually have a snack and do a little more cleaning up. I try to stay on top of that throughout the day! Sometimes we will go out somewhere, like the library, a park, for a walk nearby. This is not as likely in the winter as it is in the summer. If it is nice outside, they often will go out in our yard and play with the neighbors or come up with their own games. They like to gather pinecones, dig in the mud, hunt for “buried treasure,” or try to build forts. We have some nice playgrounds within a few miles so once it is nice we’ll be likely to go there often. They’ve built themselves a little “fort” to watch their movies. In the late afternoon there’s usually more music and Minecraft, or perhaps other TV shows, while I cook dinner. My youngest currently favors Fireman Sam, Daniel Tiger’s Neighborhood, or Bob the Builder. If he’s cranky we turn on what he likes! They’re working on a small excavation project — finding some jewels. I am usually busy in the kitchen until my husband gets home, unless I’m making something easy that can cook without much attention (crock pot, casserole, soup). If I have extra time I might sew or check in on work again while the kids are playing. When my husband gets home, there’s another mini-clean up from whatever they have been doing. Then sometimes there is family Minecraft time, when my husband guides the kids in how to build new things, program simple things, etc. They have gone from simply digging trenches and killing creepers to actually understanding how to gather supplies, build an area, and do more with the game — learning long-range planning skills. In nice weather, they might head out for a walk and some geo-caching instead! After dinner is over they are usually sent to play upstairs for awhile, while we relax downstairs (the adults), fold some laundry, etc. Some nights I go upstairs and work or even head out to a coffee shop to work while my husband holds down the fort at home. This is my major work time, outside of weekends, right now, because I can focus and know the kids aren’t doing anything crazy (or if they are, someone else will deal with it…ha). They will build more Legos, forts, look at books together, and sometimes play on our iPad on www.abcmouse.com. Occasionally we will go out in the evening, to our chiropractor or in the warm weather, to a park or “somewhere fun.” Usually they play together at home though. Around 8 – 8:30 we finish final bedtime snacks and head upstairs. Everyone does their usual bedtime routine (bathroom, jammies, etc.) and we chase them around and play with them, and spend some time talking to each of them. Then we tuck them in. Occasionally, upon request, we will sit with the older two and read with them — they have to “help” us by saying all the words they know (a handful for my 5 YO and most for my 7 YO). And that’s it! That’s a typical day here. Don’t forget to grab your copy of Unschooling From Birth to Early Elementary! We’re offering two free bonuses with purchase through Sunday, 2/15/15. “10 Fun Activities for the Whole Family” (including ideas on how to make it fun and educationally valuable to a wide range of ages) and “How to Make the Best Use of Local Resources” (how to find the best resources in your area and activity ideas once you’re there). The PDF and Kindle versions sell for $7.49 each, and the print version sells for $10.49! What does a typical day look like for your family? I am looking to start un-schooling my 10y/o after YEARS of homeschooling my other children, The idea of no sched is exciting and scary. I keep thinking she will never “want” to do anything learning wise that she will just want to play. Any advice on making the switch? Give her some time — for the first few weeks, she may not want to do much because it could all sound like “school.” It takes time to de-school and for natural curiosity to come back. If she asks questions or asks you to help her with things, then go with it! For example, one of mine loves cooking and always wants to read/write/create recipes. Another has recently taken an interest in weather. So, we watch cooking shows, cook, create our own recipes. We check the weather daily, watch videos on how weather is made, and are looking into science experiments on weather. Remember that some play IS really learning too! It’s okay to play.